These photos are from my July, 2012 trip to Reno, Nevada. I was in town for a convention, but there was a major street festival right outside my hotel, so I skipped most of the presentations and when out taking photos. Genoa is the oldest settlement in Nevada boasting the oldest saloon and oldest home, the pink house. It seems the saloon is so old that it has lost its original name. The bloody Marys are supposed to be famous. The guys on Harleys started in Reno and would circle Lake Tahoe before returning to Reno that evening. On Independence Day weekend Reno hosts the All-American Barbecue Festival and the Firecracker 500 off road race. This set contains informal portraits, candids and performers. The high plains of Northern Nevada are special with lots of sunshine, moderate afternoon high temperatures, cool evenings and low humidity. It was beautiful in the afternoons when the sun slipped behind the Silver Legacy and Eldorado buildings. 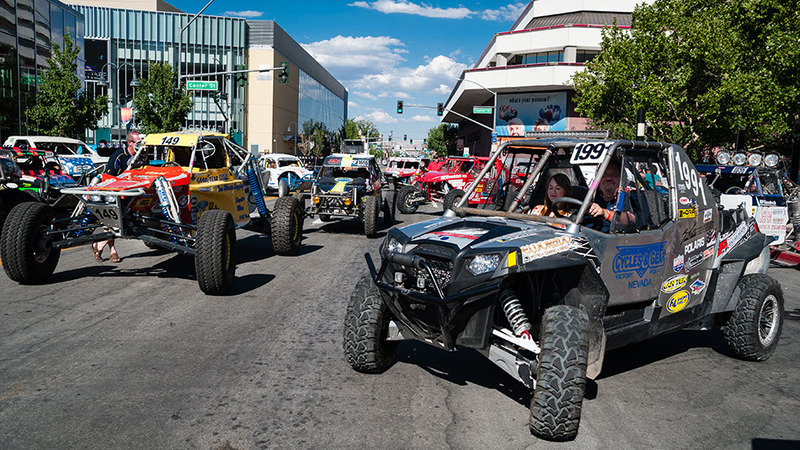 Over the Independence Day weekend Reno holds the All-American Barbecue Festival in conjunction with the Firecracker 500 off road race. A booth serving up very tasty BBQ was run by the Silver Legacy Hotel. I highly recommend it if you are planning a stay in Reno. The high plains of Northern Nevada are special, with lots of sunshine, moderate afternoon high temperatures, cool evenings and low humidity. It was very nice in the afternoons when the sun slipped behind the Silver Legacy and Eldorado buildings. Up in the high plains of Nevada sits Reno, not far from the shores of beautiful Lake Taho. On Independence Day weekend Reno hosts the All-American Barbecue Festival in conjunction with the Firecracker 500 off road race. The event has several homage bands, and iss held downtown on Virginia Street just outside the wonderful Silver Legacy hotel. Monster, makers of the energy drink showed up with a bunch of models in costumes that were rather skimpy, accompanied by motorcycle boots. In the heat of the afternoon the girls went out on the tarmac while two wild freestyle bikers on 600’s did wheelies and burnouts around them. I can tell you it did not do their beautiful hair any good. Although these girls are models who instinctively pose, I did manage to get a few shots in street candid style. Click on the small photos below to see large on a black background. Over the Independence Day weekend Reno hosts the All-American Barbecue Festival and the Firecracker 500 off road race. Bacardi showed up with a bus load of pretty girls decked out in mini dresses and shorts to promote their rum. Girls wearing hoods were promoting Wolfberry flavored rum. Some of the girls are models, others college students earning money to get through school. One told me she got three full days of work out of the festival. Pretty girls giving out free shots of rum is a great combination.